Charlotte Keegan, who lives in the Molokai Neighborhood, was having a conversation with Director of Nursing Janinne Grimes. She was telling Janinne that she felt lonely. 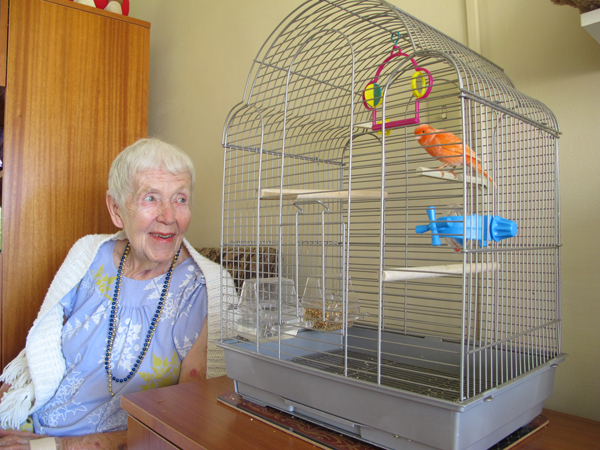 When Janinne asked how we could help her with her loneliness, Mrs. Keegan responded that she used to have birds when she was younger, and wished she could have a canary of her own again. Mrs. Keegan’s daughter was approached with the idea of getting a bird for her mom, and she agreed. She picked up a cage and some supplies. Administrative Secretary Temmie Faudan went with Mrs. Keegan to the Maui Pet Shop in Kahului where she chose a beautiful orange canary and named him Peri. After getting a clean bill of health from a local veterinarian, the canary joined our family at Hale Makua Wailuku.